Welcome to June 2014 SIGACCESS newsletter. The first article in this issue presents collaborative work by Ravi Kuber, Shaojian Zhu, Yevgeniy Arber, Kirk Norman and Charlotte Magnusson that uses geomagic touch haptic devices to improve the non-visual Web browsing process. The second article by Nic Hollinworth, Kate Allen, Gosia Kwiatkowska, Andy Minnion, and Faustina Hwang discusses a project that engages people with learning disabilities as co-designers in the development of interactive sensory objects. The third article presents the work of Dr. Stephanie Ludi to improve access to math and science lecture material for visually impaired students. 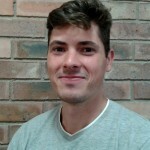 Hugo Nicolau is an Assistant Professor at Instituto Superior Técnico (University of Lisbon) and a researcher at INESC-ID. His research interests include human-computer interaction, accessibility and mobile interfaces, focusing on the design, development, and evaluation of novel mobile interaction techniques for people with disabilities, either induced by context or health factors. He received his PhD in 2013 in Information Systems and Computer Engineering from the University of Lisbon in Portugal.